the other pic which didnt come out so well is of my 3" oxfords which are the heels you wear when not wearing heels and suitable for almost all occasions. rather discrete. I'm sure with the jeans rolled down to their regular position, your heels would be as good as invisible. Quite sturdy, too, so no slipping or sliding mishaps. That first piccy with the 3" Oxfords is difficult to read unfortunately. It really does look you have regular shoes on, which I guess means the outfit works? Thanks for your comments freddy. It isn't a construction zone yet, still a demolition zone with around 700 building disappearing. It was the first day of giving the general public acces into the center of town as it is becoming safer to do so and there were a lot of people around taking pics etc. I got really brave and rolled by jeans up, but often I wear the boots with trousers over. The 3" oxfords cover really well and do look just like regular shoes, with maybe a little more heel than one would normally see. It isn't a construction zone yet, still a demolition zone with around 700 building disappearing. It was the first day of giving the general public acces into the center of town as it is becoming safer to do so and there were a lot of people around taking pics etc. You for walking it, the shoes for surviving. Might be a Pacific Rim thing? In my old home town, there's a LOT of Chinese students, mostly here from China. It's not at all unusual to see the girls wearing ankle socks with shoes. Might be okay under trousers, but not with the length of leg revealing skirt they usually wear. Us Brit men are famous [or infamous] for wearing socks while out in the sun in sandals. [Other Europeans think we are style-less morons.] Even Mrs Freddy thinks it's bad form for me to consider socks while not covering my legs....... Even if I'm wearing trainers. Young men folk [anyone under 30] won't wear socks in casual shoes as a style statement. Keep the pictures coming though. Background to them, also very welcome. Certainly shows off the height of the heel better. Don't know why, but it seems to? This issue has been a long standing problem for me. 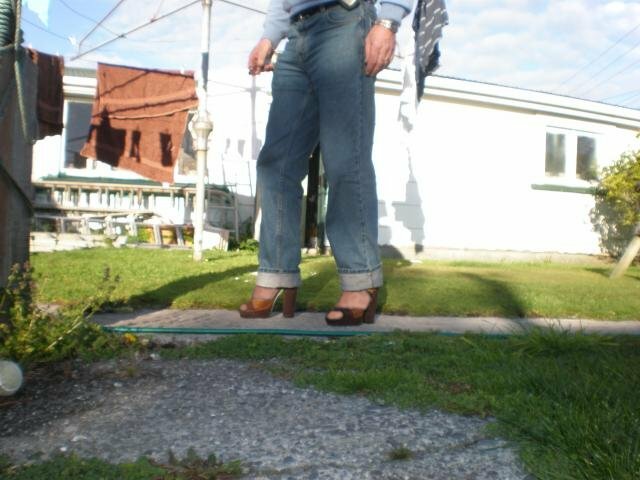 Thin skin coloured hose looks good with sandals [and court shoes], but I have always associated older [women] folk wearing socks with sandals. A memory from my almost forgotten childhood perhaps? My tastes aren't everyone's, so I'd only go so far as to suggest a change. I'm never being mean when I try to guide others to the 'righteous' path, and am always respectful of the choices people have made. All that aside, you can certainly 'walk the walk', and in respectably high heels too. I'm sure we could all learn a thing or two from your experiences. Forget about heels, what do you think when you see some one in jandels (flip flops) with socks? With the young and trendy who I already mentioned wouldn't wear socks with any casual shoes, one of them wearing socks with flip-flops would be considered a serious style faux-pas. Older folk, might just think the wearer was a bit 'soft' of mind. Until about 7/8 years ago, you might never see an umbrella held up by an adult when the Sun shone. Never. A baby might have a small one covering it while it was in a push-chair [aka pusher], to protect it from the heat, but that would be it. Ms Chanel is responsible for a lot of skin cancer, be it inadvertently. Times might change a little, and lonterm skin care might increase the popularity of untanned skin once again, amongst the indigenous population here. But socks in casual shoes? Please, no? That said, I notice Madonna has in one of her video's, worn knee high hose with shoes? Okay, I'm not at the cutting face of fashion, but even if I were, I'd still think "that doesn't work". Typical wearer of knee high hose in the UK, would be an older lady wearing trousers, or more usually she would be wearing a long skirt. I have very much in mind, my elderly [83 year old] mother when I make this comment. Maybe fashion is moving on [backward] and I just don't get it? To me, socks are for trousers worn by men, and children in short trousers or dresses. I've seen very little to indicate this isn't the case from my limited exposure to younger people here in the UK and abroad [Europe]. About every 6 years or so, a style of Winter over-knee sock becomes slightly popular, but seldom mainstream. Oh, and I've just realised; the national dress of Scotland includes knee high socks. But the daggers tucked in them, seem to make them much less feminine. Again, not how it would have gone over here. "Oi mate! D'ya know you put ya girlfriends shoes on this morning?" Already been said a couple of times, but you are probably the bravest person here. Thanks Freddy. Had two guys today say in en elevated voice" hi yaaaaaaa" then his mate went " smooch, smooch, smooch"
Did you check the new pic I taken and uploaded? In my point of view, it looks the way it should look...I might have a twisted point of view about footwear, but for me flats does not look normal. On your picture, it all looks normal. Thanks love4 heels, they are so comfortable to wear, I just love to walk and walk in them, usually between 4 and 6 kilometers in a two hour lunch break, then multiply that by four days a week and the boots wear out about 100 kilomtres so need heel tips, do heel tips twice then the boots are stuffed. I just love to walk and walk in them, usually between 4 and 6 kilometers in a two hour lunch break, then multiply that by four days a week and the boots wear out about 100 kilomtres so need heel tips, do heel tips twice then the boots are stuffed. I too enjoy walking in heels, and maybe it's the thing I enjoy most about them. Sure I like a high heel, and a shoe or boot with a nice shape, but the best bit is the walking in them. When leaving a part-time job around 2 or 3 years ago, often at 2 or 3am, I would use the longest/quietest route home I could. The walk just a little short of 2 miles. Bliss! At the time I'd gotten fairly fit I was walking so much, and may explain the slender shape of himself [blacksheep] in his pictures? Not only the bravest here, but the fittest too? It looks very normal (in my eyes). A slim jean looks better without 'gather' wrinkles around the ankle in most circumstances, so the cuff up [bottom 'turned up'] does look better? For this reason, I have 2 sets of jeans, regular 'boy' shoe length jean/trousers, and longer 'girl' shoe jeans. I have at least three times as many 'girl' length jeans and trousers .... Not sure why. If I had a working camera with me, a visit to Zara the other day would have illustrated my point very well. I think the photo I tried to take with my phone, didn't work out. She had jeans on that practically covered her heel, and it might have been her legs were so short the jeans had to be worn that way anyway. It made her legs look like a regular length either way. My preference would have been a slightly wider bottom [flared - we call "bootcut" here] so the line of the trouser flowed over the ankle. Unsurprisingly called 'bootcut' for wearing with a high heeled boot (or high heel). Because these jeans were a bit tight, they gave away the outline of the shoe, and actually showed where her leg stopped. So did not look as good as it could have. Cuff up, but would have looked more 'trendy' with bootcut jean hiding the heel and making you look taller/leaner. Not that you don't look lean enough. While being a less than perfect image, hopefully the shape of the shoe can be seen through the (too tight) jeans. If she had been wearing a bootcut jean, no-one would have known (or noticed) she was wearing platform shoes with 6 inch heels. FF, I also prefer that the jeans cover the footwear. But for myself, my jeans will cover the shoes.. He's a lot braver than me too, as I would never show off my heels in public, much less in daylight. Thanks for your comments, it was one of those times when I was felling confident in a particular look, however with these new boots which are an inch higher. Than I have been wearing and with higher elevation I could no longer cover all of boot, and the stretch jeans were tight around the boot when over boot without cuffs turned up. It made we then wonder, what does look better. A guy in daytime in 5" heels may not be a common sight, but if someone does notice, it needs to at least look in style. Baggy trousers over looks clumsy and is if one is ' pretending' that they aren't wearing heels and no one will notice, so to be bold, go slim fit, and show with style seems to me to be more positive.